The purpose of this study is to propose a fundamental scheme of an assessment framework for habitability towards Hanok, the Korean traditional housing. For this research, the comprehensive degree of residential performances of Hanok has been analyzed and its assessment factors have been classified by three major indexes: architectural planning (spatial composition), site planning (town settings) and sustainability (environmental performance). For this study, survey results from main users, the specimen residents living in Hanok currently, were collected for checking of the habitability. Many precedent researches about the residential performance for Hanok, first of all, were performed to induce the assessment elements of the proposed indexes and the evaluation framework. This paper also includes a knowledge-based qualitative analysis of the design indexes in aspects of both architectural space and site components, and examines the effectiveness of the environmental sustainability as well. 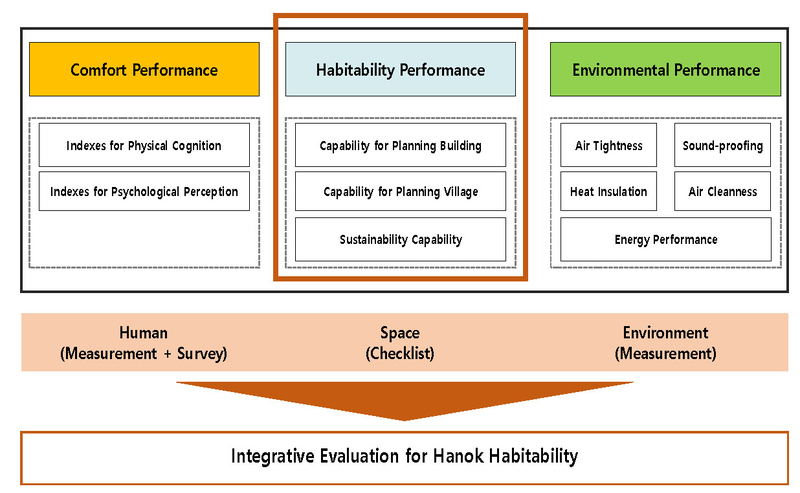 This research has finally suggested an integrative evaluation framework for Hanok the field of habitability that could assess over real residents of the interior Hanok space in living conditions by checklists. As a result, the proposed framework has great possibility in applicability to keep its own values for the practical field of Hanok professions. Recently, there have been a series of governmental projects regarding a revival of Hanok, the traditional residence in Korea, that aims at preserving the unique building style and evaluating for its own cultural values . The projects are widely including a remodeling of the single house, a renewal of the governmental office, a planning of the new-styled Hanok village and so on, but they are unlikely being accepted as a type of the contemporary housing in Korea, because it is normally composed of the wooden structure and causes a problem for mass-production . This study, therefore, tries to establish the main concept of Hanok habitability compared to that of the contemporary housing and propose the evaluation system for the comprehensive residential performance. For this, precedent researches about Hanok performance have been investigated, main evaluation indexes for the habitability induced, and the preliminary checklist for the assessment organized. This research, then, aims at verifying the suggested evaluation system with the residents who are students and/or professionals in the field of Hanok industry. Hanok needs to expand its meaning in aspect of architectural design and construction to experienced space containing human cognitions and traditional thoughts rather than its physical or economic status for production. It means national own values in spaces like unique histories, places, images, memories, symbols and so on . In addition, it is emphasized that environments and relationships among human beings have to be understood with the concept of natural recognitions, behavioral perceptions and living experiences. 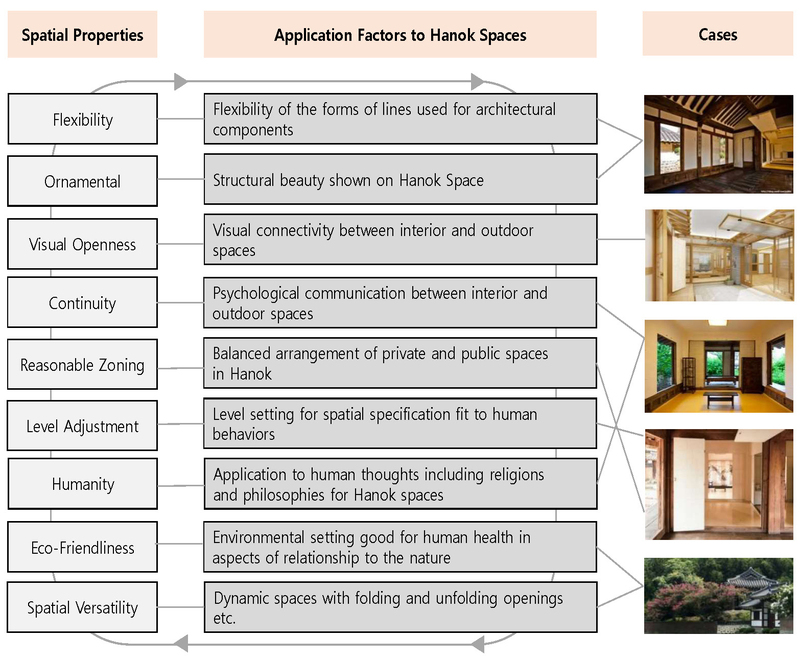 With these considerations, residential performance of Hanok could be assessed in conditions of two main categories such as qualitative and quantitative. The former can be measured in forms of numerical data with the scientific methods and tools, and the later requires human experiences and responses about the space with the questionnaire [4, 5]. The residential performance for Hanok, in this sense, can be divided into three subcategories that comprises habitability performance, environmental performance and comfort performance. The habitability performance is a sort of qualitative factor in design capabilities and includes architectural planning, site planning and sustainability indexes for the evaluation. The environmental performance proves physical conditions such as air tightness, air cleanness, heat insulation, soundproofing and energy performance. And, the comfort performance is composed of factors in physical cognition and psychological perception. The method of evaluating for environmental performances towards Hanok employ the official guideline defined as Korean Standards [6, 7]. The target for the assessment is both interior and exterior settings like natural atmosphere and indoor spatial environment. Additionally, simulation programs to prove energy performances are to be used for the comprehensive evaluation. Therefore, the main methodology of assessing comfort performances should be a kind of integrative way and could be classified into two categories for the effectiveness of evaluation. The one is psychological indexes brought from user surveys such as spatial usability and building beauty. The other is physical indexes based on environmental experiments for the interior space such as temperature, humidity, air tightness, and etc. Among the above three categories, this study is focusing on the habitability performance. Haonk has been built with following the principal of the habitability in contrast to the contemporary building that pursues functionality fit to the modern life. The original concept of the habitability includes a capability of the self-controllability for spaces by users themselves and this specialty is called planning capabilities for interior spaces and outdoor sites. Because the contemporary housing is losing the above theory, the habitability is one of the most important characteristics while building Hanok. Hanok has many advantages which including both cultural and environmental values. However, Hanok has a lot of problems that do not meet the conditions of modern society, especially in the area of collective housing, and it is difficult to have spatial rationality . This shows that there is a problem of the Korean traditional architecture, which does not match the trend of modern society that emphasizes rationality, and there is a limitation that the Hanok cannot be activated as a modern residence in Korea. Nevertheless, the cultural value of Hanok and the habitability value of Korea, that are traditional residence values regarding Korea, are not negligible compared to the comfortability of modern residence. It can be seen from the case of the national project and mentioned that promotion policy by Korean government for the construction of the Hanok suggests that its values in aspects of tradition and habitability are very important. While there is such a social background, Hanok is hardly realistic to accommodate various users' needs. Therefore, it is necessary to introduce the necessary factors according to the characteristics of each user in order to evaluate the settlement of Hanok, besides the elements unique to the Korean traditional residence. This study focuses on identifying the concept of the resident habitability and introducing it into the Hanok evaluation for residential performances by classifying the unique residential values from various user groups, that can be defined as household types in the modern society according to the lifestyle. For, it can be the ultimate goal of the study to propose a modern method of evaluating the habitability performance of Hanok using household patterns. So, the main target of this study can be said as Hanok residence, but the main application would be the form of modernized Hanok simultaneously. That is because the traditional dwelling has disadvantages in various aspects such as convenience and human scale in comparison to the modern housing, although those have been becoming major components of the traditional Hanok architecture. The reason why general architecture is not the main object for this study is because the majority of the buildings built in Korea are lack of traditionalism, and the other values like rationality rather than traditional one such as habitability is considered more importantly . Naturally, the existing evaluation system for the residential performance of modern buildings is too robust to be applied to Hanok and an alternative evaluations framework can be suggested accordingly. In this study, after analyzing the habitability evaluation presented in the previous researches, the detailed items constituting for the habitability evaluation were divided into six categories according to main common points. And the residents of Hanok are classified by two criteria like age and family structure, and the characteristics of the residential value for each type in the classified group are derived and suggested. The characteristics of the residence values from each type are summarized through the analysis of the above process, and the standard of the residential values are established as the evaluation indexes. As a sample of the construction for evaluation items of Hanok, this paper collected and sorted findings from the previous researches first. Mainly, the composition of the evaluation items was classified by three aspects in them: spatial components, village panning indexes and sustainability for the traditional housing. There were subcategories applicable to all major categories such as planning, performance, convenience, safety an so on. In addition, there were also residential values such as resource utilization and human centrality in dependent on the characteristics of each major category. The value of each residence was listed without a consistent standard that seems to follow the general evaluation system of the modern housing without specific criteria in the process in preceding researches. Moreover, some residential values were perceived as meaningless items for certain users. The detailed evaluation items from those data can be composed of thirty two items that have common characteristics from each item in five elements of the planning part, area, safety, convenience and management performance in spaces. Additionally, local factors and natural affinity has existed as characteristic elements. The residence values with common characteristics were grouped into only habitability characteristics without distinction of major classification, and nine subcategories were constructed accordingly. Those established subcategories consisted of six items that could be evaluated in all major categories found by previous studies and three items could individually be evaluated. The above items were divided into spatial planning, territory, safety, convenience, manageability, and variability, and classified into locality, sociality, and sustainability according to the unique characteristics of the major categories. As modern society developed, the performance of housing required by residents’ needs and the type of housing have changed accordingly depending on the required performance. For example, one of residential performances required in agricultural society was large work space, and the performance required for housing in the industrialization period was shortening construction period . However, the demands of users in modern society are very diverse. The traffic location is more important than the large space in the residence of university students, and access to the medical facilities is important for old age residence. As a result, the types of dwellings have been divided into various categories such as studio, apartment, and detached house. In this situation, assessing the dwelling performance of such a variety of residences from a single point of view is not a valid evaluation method. Therefore, it was recognized that various aspects of users’ lifestyles should be added to the performance evaluation item. In reality, it is impossible to distinguish all the users of the modern society. This is because there is no absolute criterion for classifying the residents. Therefore, the lifestyle was selected as the most common standard for identifying the type of user. There are various criteria such as age, family composition, salary, personality and so on in the lifestyle . When the research group is divided into the types based on the criteria included in the lifestyle, various approaches are possible and the missing parts in the research process can be coped with. In addition to the lifestyle, various criteria such as history, area, and distance exist, but those are concluded that lifestyle is the most universal standard considering to be applied into lifestyle. As mentioned before, lifestyle has various criteria. So, among theoe criteria, the investigation could be established with the most representative criteria related to the residence value. Factors influencing residence value among the criteria included in the lifestyle include age, family type, individual history, economic ability, personality, and individual aesthetics. However, individual history and personal aesthetics are too large in the range of the judgment category that each user has, and there is no meaning in selecting a criterion. On the contrary, there is no meaning of criterion because economic ability can be a factor to select space as an external factor irrespective of individual preference for residence value. Therefore, age and family type were selected as the most appropriate criteria among the suggested factors. The first criterion, age, can form a group with a certain level of validity through group formation through a range of compartments. In addition, age is a standard that is representative enough to be used because of a reference in research that exists in other fields. The second criterion, the family type, can confirm both the physical condition of space and the aesthetic condition of user at a certain level. In addition, because it changes in response to social change, it can grasp the change of the house according to the change of society. Based on the above judgment, this study has set the specific standard of the lifestyle to the age and the family form . According to lifestyle standards, the user groups are divided into groups of five age groups and three family types, respectively. The age-based groups were classified into five groups: adolescence, adulthood, marriageable, manhood, and Senescent. They are based on various factors such as the identity of space, economic capacity, Conditions were taken into account in the case of the family type, the group of two households and one household. In the case of the family type, one-person household, classified according to the characteristics of the modern society, two-person households and first generation household were classified into groups. In addition, the other family types classified as second generation households and third generation households are not included in the group because they are the combination of the three family types mentioned above. Regardless of the group, the common characteristics are that the space preference changes according to various criteria such as the user's life cycle, children, and activity time, and the safety and the convenience that residences should possess. Adolescents are less mature than others in their dominance over space, and have vague personal standards rather than specific factors such as physical and environmental performance of space . In adulthood, the point of difference in residential value and space structure and preference differs depending on the sexes. Especially, in the case of the activity space, the male prefers the physical activity space, and the female prefers the dress space [13, 14]. The criterion of preference for space changes from family to center rather than individual, and values related to children become important. In addition, there is a growing interest in health and well-being, including old age and healthy living . As the family form of grandparents, parents, and children enter the modern society and become nuclear family, the elderly independent household composed of the first generation is increasing, and the concept of housing is in the process of changing from property to settlement . Senescent prefer to live independently from their children such as children and grandchildren, and they also want a form and function of space that can accommodate the uncomfortable change of the body . Table 3. below shows the residence values that age-specific users consider important. Younger people tended to emphasize the use of space, but elder people tend to emphasize sociality. The whole group has recognized as an intermediate space that distinguishes between the 'open space' and the 'entry space' in the form of pursuing a space independent of individual or group. In addition, the community space and the public space are also of high importance. This seems to be indirectly related to the communication of users in the household and the guarantee of the personal area. Recently, there are various types of households such as elderly households and female nursing homes like multi-family housing, studio, dormitory, etc . In the future, changes in family members may appear. In terms of size, it has a similar size to that of the first-generation house, but the use of the free space is mainly used for personal life such as hobby space, guest space and public space . 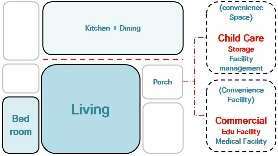 There are similar size to the size of the residence of two-person household, but there is a difference in the composition of space such as existence of child space. Table 5. shows the residential value of each household. The larger the household scale, the greater the importance of territory. The importance of the space existing inside and outside the house also changes due to the difference in the residence value that is important for each classified group. 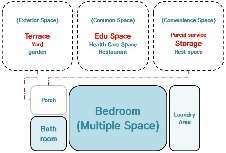 The main space has the similar importance in all the groups as the bedroom and the living room, but there is a difference in the sanitary space and the space ranking in the external space. The main space of each group is showed as Table 6. The importance of the space existing inside and outside the house also changes due to the difference in the housing value that is important for each classified group. 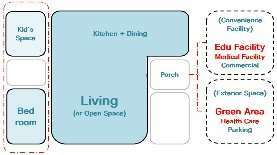 The main space has the same importance in all the groups as the bedroom and the living room, but there is a difference in the sanitary space and the space ranking in the external space. The main space of each group is summarized as below. Overall, priorities are reflected in the space in which users are primarily active, such as living rooms, bedrooms, and private rooms. The characteristics of the age group show that the requirements that the age can have or the changing housing value are reflected in the space. Adolescence does not take into consideration the whole of the housing. On the other hand, marriageable reveals overall consideration for housing. In addition, as the age increases, the plan performance of the space that can accommodate the fluidity and the body change of the space is required rather than the space use performance. The characteristics of the group according to the type of family can also be seen through the pictures. All three groups prefer to make a distinction between the private territory and the public territory, and thus the territory is an important factor in all family types. On the other hand, the demand for external space or convenience facilities differs from group to group. The external space that is important for one- person household is storage. This is probably due to maximizing the use of personal space in one-person household, which emphasizes practicality of space. On the other hand, it can be seen that educational facilities have the highest priority as convenience facilities required by first-generation households. This seems to be due to education concerns for children, which is the most important housing value in first-generation households. The Hanok habitability basically have followed the original concept of the space design shown on Korean traditional architecture. Korean own space has been planned with the relationship between human and nature, and its theories include flexibility, ornamental simplicity, visual openness, continuity, reasonable zoning, level adjustment, humanity, eco-friendliness, spatial versatility and so on. These spatial keywords have been adapted to Hanok and absolutely important to try its revival in forms of the contemporary space. So, the Hanok habitability is deeply engaged to planning capabilities. The planning capabilities can be considered with the scope of physical boundaries comprising Hanok. Those ranges are divided into three areas in terms of spatial scales: house, village and nature. First, the scope of house is composed of the building space called Chae and the garden which is Madang in Korean, and Chae is divided into Sarang-Chae (visitor’s room), An-Chae (resident’s room and Haengrang-Chae (service room) in detail. Each Chae has Maru (corridor), Bang (room) and Booeok (kitchen). The scope of village is planned for a few block having grouped houses, roads connecting them and community spaces for village people. The scope of nature is the farther environment like mountains, hills, rivers and streams surrounding the Hanok village, and it provides comfort settings for Hanok. The AHP (Analytical Hierarchy Process) questionnaire and the evaluation questionnaire could be strong alternatives for qualitative evaluations in this step and require definitions for each element. These definitions serve as the basis for the AHP pair-wise comparison and are used as a measure for evaluation in the evaluation questionnaire. The definition of each element is summarized in the order of material aspect and architectural aspect as follows. The evaluation index for the Hanok habitability in site planning is cordially related to the status of the surrounding area and physical properties. First, spatial composition in aspect of the neighborhood is important, and it means regional tradition is the main factor for defining the characteristics of the site. Second, reasonable circulation among housing blocks determines the identity of the village and relation of the neighborhood. Third, spatial composition according to the terrain level is a sort of the concept in traditional site planning in Korea. Table 7. indicates the evaluation indexes about the Hanok habitability in site planning. The evaluation index for the Hanok habitability in sustainability is engaged to the status of the surrounding environment and natural properties. It also includes the spatial flexibility and veracity. First, spatial flexibility in aspect of the succession to the future generation is important, and it means essential values is to be adapted to coming ages. Second, eco-friendliness determines the fundamental identity of the green housing like Hanok. Third, maintenance capability is a sort of a traditional concept in asset preservation technology. Fourth, structural stabilization will make Hanok last as a valued traditional asset. Table 8. explains the evaluation indexes about the Hanok habitability in sustainability. The evaluation methods for Hanok habitability in aspect of sustainability is mainly for physical conditions, and is a form of the questionnaire based on residents’ responses derived from the field survey. In addition to the resident surveys, a set of drawings about sectional details of Hanok structure are essential for the assessment. The importance of six residence values that are not affected by the category of large categories such as spatial planning, convenience, and safety has remained largely unchanged, and all the above factors are important in all groups. Of course, the details of the arguments given above and the reasons for their importance differ, but this seems to be due to the fact that the user's needs were most clearly reflected in the planning. Or it may be because it is a human primary requirement. On the other hand, the emergence of residential value that is peculiar to a specific group such as sociality and stronghold is also noticeable. The sociality appeared mainly in the adulthood and the elderly, this is because both groups have a new lifestyle or change their surroundings, away from existing lifestyles. Regardless of the change in family type, the important factor is territory. Because of the feature of private territory, the user wants to own territory regardless of the family type. Furthermore, there was a tendency to reduce the accessibility of private territory and to set buffer space to protect private territory. Regardless of the group or the standard, the feature revealed was that the external space required by the family form over time showed a similar pattern. In the group classified by age, there was a tendency to require space related to children as children existed. Likewise, in the group according to the family type, the children were included in the family members, and showed a tendency to demand a space that could be helpful to the child. Based on the characteristics of each group, the new habitability evaluation items were added to the existing habitability Evaluation and the existing habitability evaluation items were modified based on the items with the common parts. The classification of the items is shown in Table 9. This index includes the evaluation items for habitability performance. An item for habitability evaluation is a unique performance of Korean traditional architecture and it can be said that it is a criterion to judge whether it has a habitability performance by applying it to a modern Hanok. Therefore, if it is possible to evaluate modern Hanok based on this evaluation items and evaluate the Hanok habitability performance by complementing this evaluation method, this study could suggest an evaluation system that can evaluate the inherent performance of Korean traditional house. As mentioned previously, Hanok has unique residential values that match the Korean culture. The characteristic that the user is staying in the residence as long as possible is the most representative value like the comfort of the residence and the environmental performance around it. However, as Korea enters into modern society, it is affected by Western culture and various lifestyles are born, and traditional residence values are becoming meaningless. But, traditional residences have a tradition and emotion that are unique to Korea, and have representative images of Korea. Therefore, it is very important to understand the benefits and cultural values of Korean traditional houses to Koreans. As suggested, this study has built a new evaluation system that insert the lifestyle of modern people in addition to the evaluation system of the domicile performance which is the inherent residence value of the Hanok. The suggested evaluation framework needs considerations for contemporary residence value items at the same time with traditional values, and is trying to apply and evaluate it as a modernized Hanok. Finally, this study could verify detailed items through the supplementary evaluation criteria to create a new evaluation item for assessing the Hanok habitability, and could propose an integrated evaluation item that evaluates the habitability of various Korean traditional houses as shown on Fig. 3 and evaluates the value of modern houses at the same time. Based on this evaluation item, Korean traditional houses show the strength of the habitability side. The suggested evaluation system includes both numerical quantitative analyses and qualitative survey prediction that could provide more accurate comprehensive results. It can be emphasized that the result showed reasonable records towards the evaluation guideline for assessing Hanok habitability. The purpose of this study is to suggest new habitability evaluation methods that targets the Hanok and to propose the new way of the assessment system to be used for Hanok professions. Its assessment factors for habitability tend to be categorized by architectural planning, site planning and spatial sustainability. It was turned out that both quantitative and qualitative factors have to be analyzed towards the integrated evaluation, and this study has suggested the comprehensive assessment for Hanok habitability. This study started to suggest evaluation items for the performance evaluation method of the Hanok and suggests that the evaluation methods considering the users should be added. By analyzing the existing researches, it was possible to compress the habitability evaluation items, and the six evaluation factors were obtained accordingly. In addition, this study could identify issues and requirements of each user through the classification according to the lifestyle of the users, and apply them to the habitability evaluation items so that the characteristics of the users can be reflected in the habitability performance items. As provided in the previous chapters, this study has suggested a new assessment indexes that insert the lifestyle of contemporary residents to be used for the evaluation system of the habitability performance that is the inherent residence value of Hanok. The results of this study can be used as a basic data to build up the performance evaluation system of the Hanok in the future. Furthermore, this study will be recognized as a basic research that can construct the evaluation item and habitability evaluation system through the follow-up study. Through these processes, it is expected that the habitability performance evaluation system will be used for actual residential performance evaluation. Then, an integrated habitability scores would be derived using the weight. As a result, the newly suggested evaluation method is expected to insure high efficiency of the living experience by the residents. The proposed system includes correlative factors that would show more precise results. It was turned that the result showed satisfactory records towards the needs of Hanok residents in aspects of the habitability than ever before. As ongoing research study, verifying performance grades using AHP should be processed to apply the suggested evaluation system for pilot cases and the practical field of Hanok. Each weight for habitability factors could finally be established using AHP, when examinee surveys would be conducted and its approximate tendency could be assessed by residents; this part remains as an ongoing study for the near future. After analyzing the surveys, the habitability elements with the respective evaluation indexes are measured through a form of the questionnaire. This research was supported by a grant from Urban Architectu re Research Program (Technology Development of Design and C onstruction for Large-Space Hanok over 10 Meters, Developme nt of Hanok Technology, Phase III) funded by Ministry of Land a nd Transport Affairs of Korean Government. (Project No. : 18AU DP-B128638-02). Rhee, Bae-Hwa, The Typological Analysis of Space-Composition in the Traditional Korean Architecture, Journal of the Architectural Institute of Korea, 14(2), (1998), p183-193. 이배화, 한국전통건축에 나타난 공간구성의 유형학적 분석, 대한건축학회 논문집, 14(2), (1998), p183-193. Mo, Jeong-Hyeon, and Lee, Yeon-Sook, Typological Analysis of the Flexibility Concept for Sustainable Housing, KIEAE Journal, 3(3), (2003), p59-66. 모정현, 이연숙, 지속가능한 주거 개발을 위한 가변성 개념의 유형학적 분석, 한국생태환경건축학회학회 논문집, 3(3), (2003), p59-66. Han, Seung-Hoon, Im, Ok-Kyun, Lee, Mihyang, and Cheon, Deuk-Youm, A Study on the Establishment of an Evaluation System for Integrative Comfort, Journal of Korean Housing Association, 24(6), (2013), p27-35. Kim, Tae-Ryong, Kim, Kyoung-Hee, Kim, Seul-Ki, and Han, Seung-Hoon, A Composition of Monitoring System for Environmental Comfort Performance of Korean Traditional Residence, Proceedings of the Second International Conference on Advances in Computing, Communication and Information Technology, Nov), (2014. Kwon, Y., A Consumer Research for NEO-Hanok Maeul, Korean Traditional Style Village, Journal of Architectural Institute of Korea, 26(11), (2010), p97-106. 권영상, 신한옥마을 조성을 위한 수요자 인식조사 연구, 대한건축학회 논문집 - 계획계, 26(11), (2010), p97-106. Kim, Seul-Ki, Kim, Kyoung-Hee, Park, Jong-Il, and Han, Seung-Hoon, A Process of Value Assessment for Building Components of Hanok Residence, Proceedings of the Second International Conference on Advances in Computing, Communication and Information Technology, Nov), (2014. Min, Sae-Rom, and Kim, Tae-Young, A Study on the Attractive Items of Hanok in Urban Area focused on Preceding Studies, Korean Institute of Rural Architecture, 14(3), (2012), p61-68. 민새롬, 김태영, 선행연구에 나타난 도시한옥의 매력 요소에 관한 연구, 한국농촌건축학회 논문집, 14(3), (2012), p61-68. Jeon, Bong-Hee, A Study of Korean House Brands, The Korean Studies Institute, 8, (8), p275-317. 전봉희, 한옥의 브랜드화 방안 마련을 위한 기초적 연구, 국학연구, 8, (8), p275-317. Lee, Mi-Hyang, Han, Seung-Hoon, and Deuk-Youm Cheon, Evaluation for the Residential Performance towards Restoration of Hanok Habitability, Proceedings of Korean Association of Architectural History, (2017), 25(6). 이미향, 한승훈, 천득염, 한옥의 정주성 복원을 위한 거주성능 평가, 한국건축역사학회 학술대회논문집, (2017), 25(6). Lee, Chang-Jae, and Choi, Il, Post Occupancy Evaluation of Hanok in Rural Area and Comparative Study on the Perception of Hanok - Based on Hanok Residents and Architectural Designers Comparison, Korean Institute of Rural Architecture, 12(2), (2010), p77-84. 이창재, 최일, 농촌한옥의 정주성 평가 및 한옥에 대한 인식도 비교 연구 : 한옥거주자와 건축설계자간의 비교를 중심으로, 한국농촌건축학회 논문집, 12(2), (2010), p77-84. Kim, Min-Seo, and Kang, Soon-Ju, A Comparative Study on Housing Value and Needs in Single Male & Female’s Households, Proceedings of Korean Housing Association, 24(2), Nov), (2012, p143-148. 김민서, 강순주, 남녀 1인가구의 주거가치관과 공간선호도 비교 연구, 한국주거학회 학술대회논문집, 24(2), Nov), (2012, p143-148. Chang, Eun-Ji, and Hong, Hyung-Ok, A Study on Housing Satisfaction and Preferences of Living Alone University Students, Proceedings of Korean Housing Association, (2014), p359-364. 장은지, 홍형옥, 대학생 단독 가구의 주거만족도 및 주거선호도, 한국주거학회 학술대회논문집, (2014), p359-364. Jung, Da-Woon, and Kang, Soon-Ju, Double-Income Newlywed Couple’s Lifestyle and Needs of Urban-Compact Housing, Proceedings of Korean Housing Association, (2010), p178-183. 정다운, 강순주, 맞벌이 신혼부부의 라이프스타일과 도시형생활주택의 공간요구도, 한국주거학회 학술대회논문집, (2010), p178-183. Park, Soo-Bin, A Fundamental Study on Housing for the Elderly through an Analysis of Senior Adults’ Needs, Journal of Architectural Institute of Korea, 23(5), (2007), p49-58. 박수빈, 중·노년층의 요구 분석에 의한 노년기 주거 디자인의 기초 연구, 대한건축학회 논문집 – 계획계, 23(5), (2007), p49-58. Kim, Mi-Kyoung, Jang, Eun-Hye, Song, Ae-Hee, Ryu, Jin, and Choi, Ji-Eun, The Planning Characteristics of Small Housing Complex and Their Preferences for One Person Household by University Student, Proceedings of Korean Housing Association, (2010), p61-66. 김미경, 장은혜, 송애희, 유진, 최지은, 1인가구를 위한 소형집합주거 공간계획에 나타난 주요특성 및 선호, 한국주거학회 학술대회논문집, (2010), p61-66. Kim, Hyoung-Eon, and Lee, Dong-Hoon, A Study on the Characteristics of Spatial Composition and Types of Housings for Three Generation Family”, Journal of Architectural Institute of Korea, 30(8), (2014), p31-38. One-person Household One person takes care of all the activities necessary to maintain a living, such as cooking, sleeping, etc. Barrier-free plan Barrier-free elements such as chin, ramp, step height, floor height etc. Presence of accessory space Proper space to accommodate the size of residential space such as balcony, multipurpose room, warehouse etc.